UPDATE: The House of Representatives, by a 195-234 vote, failed to pass the farm bill on Thursday afternoon. It failed along lines very similar to what Nancy Pelosi predicted below; she estimated only somewhere between 26 and 39 Democrats would support the bill, and 24 did. Sixty Republicans voted no, and the bill fell 23 votes shy of passage. Notably, Pelosi also said that if the GOP made the SNAP cuts even worse, “all bets are off.” Shortly before the final vote, House Republicans passed “one of the most extreme SNAP amendments to be offered in the program’s history,” that would basically pay states to cut off SNAP benefits. Late Wednesday afternoon, the House of Representatives killed an amendment by Representative James McGovern that would have eliminated planned food stamp cuts in the GOP’s five-year farm bill, and replaced the cuts with reductions to big agriculture subsidies. As it stands now, the bill has $20.5 billion in food stamp cuts over the next ten years—a number that could grow as restive conservative members are pushing for even deeper cuts, and in one case, removal of food stamps from the bill entirely. 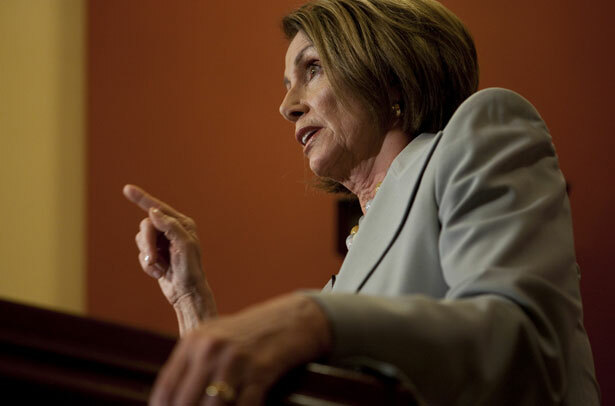 House Minority Leader Nancy Pelosi took to the House floor shortly before the vote on McGovern’s amendment and urged Democrats to vote for it, which all but eight of them did. In an interview with The Nation in her Capitol office shortly after the vote, an exasperated Pelosi said the food stamp cuts could now endanger the entire farm bill. There are some Democrats who will: thirteen Democrats on the agriculture committee, many from rural areas that badly want a farm bill to be passed, voted for the version of the farm bill with those cuts. But Pelosi predicted that only “somewhere between two and three times” that many Democrats would vote for the final farm bill with that level of food stamp cuts, meaning that House Speaker John Boehner would have to get a majority of his caucus to vote yes on the farm bill for it to pass. And many conservatives are deeply unhappy with the legislation, in large part because they feel it doesn’t cut enough from food stamps. Boehner may not be able to get a majority of them to vote yes. And if, in order to win their votes, Boehner allows even deeper food stamp cuts, then Pelosi said it’s possible no Democrats would vote yes. The cuts as they stand now would kick 2 million Americans off food stamps, including several hundred thousand children who would no longer receive lunch and breakfast programs at school, according to the CBO. At several points in the interview, Pelosi widened her complaints about the food stamp cuts to direct broadsides on the conservative, anti-government House Republican caucus. I asked Pelosi if heavily gerrymandered districts that give Republicans an incentive to only worry about primaries from the right were to blame for the hard-right—and ultimately very unpopular—policies emerging from the House of Representatives. The makeup of their district, in other words, isn’t a big factor in Pelosi’s eyes. “Now are you saying there’s a handful who would rather be voting with shared values? In a bipartisan way?” she asked. “I don’t know what that number is. Smaller and smaller.